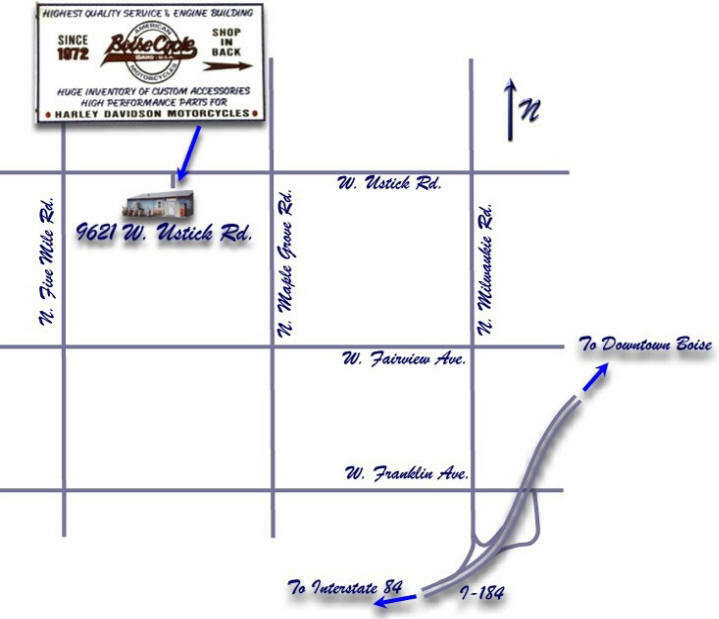 Take the Franklin Road exit and go straight ahead (North) on Milwaukee about two miles to Ustick and turn left. Follow Ustick for about 1 1/2 miles and look for the Boise Cycle, LLC Sign on the left side of Ustick. Enter and go to the back of the drive. Take the Cole Road exit and go straight ahead (North) on Cole about two miles to Ustick and turn left. Follow Ustick for about 2 1/2 miles and look for the Boise Cycle, LLC Sign on the left side of Ustick. Enter and go to the back of the drive. Saturday 10 a.m. to 4 p.m. ~ Closed Sunday & Monday ~ Tuesday thru Friday 9:30 a.m. to 6:30 p.m.
Closed Sunday & Monday ~ Tuesday thru Friday 10 a.m. to 6 p.m. ~ Saturday 10 a.m. to 2 p.m. Copyright © 2004-2016 All rights reserved.